Does it matter when you take your prenatal? Is it better to take Omega 3’s at night or on the morning Chronobiology examines cyclic phenomena (or bio-rhythms) in living organisms, and their adaptation to solar and lunar rhythms. Through years of research the top chronobiologists have discovered that certain substances are more effective when taken at night. This is true with food consumption, topical creams or lotions, and with supplements and medications. Certain nutrients women take for increasing their fertility may be better taken in the evening. B-complex (B vitamins B1,2,3,5,7,9 and 12) are water soluble and work during the night as co-enzymes in their recovery functions relating to cognitive ability, the nervous system, the production of energy, and the process of detoxification. B9 in particular (folid caid) maintains blood cell count and cell growth in the reproductive system, this this is a must for any woman who may conceive, and may also help with conception. CO-Q10 is a CO-enzyme. It’s involved in a variety of processes, playing a major role in successful fertilization & implantation. Biotin, Resveratrol, and a veriety of trace elements and minerals (like magnesium and omega 3-fatty acids) are also important for TTC. Omega 3’s (including DHA and EPA which we do not produce endogenously) are a component of the cell walls, and are indispensable for brain health starting in the womb, and support healthy circulation and blood pressure within normal ranges, along with balancing cholesterol levels. 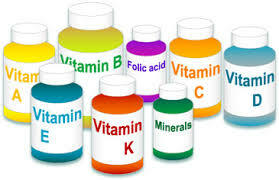 If you are taking any of these supplements, or plan to take them because you are actively trying to conceive or may potentially be doing IVF, consider taking them at night. If you have any questions about supplements, vitamins, herbs, minerals or fertility nutrition, feel free to call us! We are always happy to help guide you on your path to pregnancy in the healthiest way possible.